P.T. Barnum and General Tom Thumb. 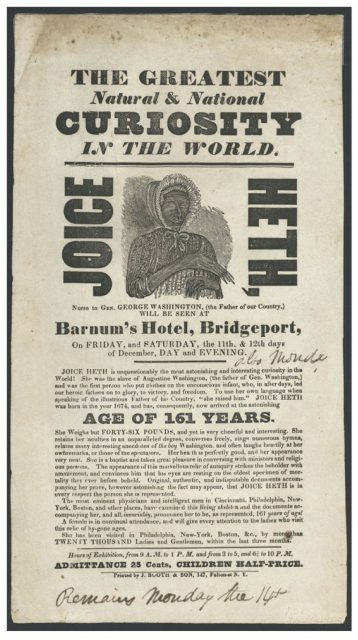 At the age of 25 he “acquired” an elderly black woman named Joice Heth. She would be the star of his new travelling show, for she was allegedly 161 years old. Heth was actually in her late 70s, and was blind and almost completely paralyzed. According to the Smithsonian Magazine, although slavery had been abolished in Pennsylvania and New York, Barnum found a loophole in the law that allowed him to lease Heth from her former owners for one year at the sum of $1000. Kind of like selling the American public that Russia helped Trump steal the election from a woman the public did not embrace. Representing a political party that had not performed. Then there’s old Bernie. He scammed his Jewish friends, mostly Democrats like Bernie, out of a smooth $65 billion with a Ponzi scheme. I would compare Mueller to Ponzi, but Bernie out-Ponzied, Ponzi. So, old Bob is named a special prosecutor to look into President Trump using Russia to steal the election from Hillary. Bob, immediately fell to his creaky knees and thanked whatever Democrats substitute for God, probably the climate change God, Gore, for this. If a special prosecutor had been name to look into Hillary and her Uranium One deal with Russia he might be in jail instead of Flynn. He signed off on that. Then he rounded up all his white shoe lawyer friends in DC and said “Folks, I’m driving a taxi with the meter running and we’re going to drive it around and around the block pretending to look into this bogus Russian deal until they flatten the tires.” Estimate range between $25-40 million for the taxpayers for that cab ride around the same block for two years. Now, the country feel like old Bernie’s clients when they found their money was gone or P.T’s when they Joice Heth and realized they paid a quarter to see a blind 70 year old-slave spin a story about being 161 years old and nursing George Washington. No one gets through life without being scammed at least once. It’s a bad feeling. But, how good do you have to be to scam 65 million Hillary voters who buy the idea that you will force President Trump out of office. Not all that good. When you have 100% of the so-calling journalists in the country selling your cab ride and the wonderful result of bringing down the awful man who took out your witch you don’t notice the scenery never changes. Today the 63 million of us who saw the cab going around and around the block are mad but vindicated. The media and Democrats who lied for 2 years do damage control like Madoff’s. lawyers. They cry like the CNN and MSNBC news people and tell their deluded minions the evil Trump is the scammer. But, enough of those 65 million voters see the likes of Bernie Sanders and AOC speaking for the Democrat party and say, ” I’m done with this”, to deliver the 2020 election to Trump. Thank you Mr. Mueller for the lovely cab ride.